American River Cafe - Enjoy riverside dining at Lake Tahoe's must-see restaurant. A wide variety of breakfast, lunch, and dinner selections feature contemporary and unique favorites. Seafood Cove - Your search for outstanding seafood ends at the new Seafood Cove Club Cappuccino - Club Cappuccino serves gourmet coffee, lattes, cappuccino, espresso, and mochas, complemented by delicious freshly baked muffins, danish pastries, scones, and more. Forest Buffet - Mouth-watering breakfast, lunch, dinner, and specialty buffets, a Friday night seafood buffet, a Saturday night filet mignon and prime rib buffet, and a special Sunday champagne brunch. 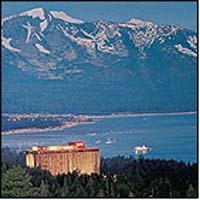 The Forest is Tahoe's only buffet with an 18th-floor view of the Lake! Friday's Station Steak & Seafood Grill - Home of the hardwood grill, serving Black Angus beef, fresh seafood, salads, and wines daily. North Beach Deli - Inspired by the famous district in San Francisco, North Beach Deli presents an array of California and Italian subs, soups, salads, gourmet coffee, and more. The Summit - The crown jewel of Harrah's Lake Tahoe restaurants, The Summit features contemporary gourmet cuisine in elegant, intimate surroundings. Tahoe Star - Dine aboard a luxurious yacht, custom-built for the legendary Bill Harrah himself. The beauty of the Sierra Nevada and this wonderful lake make Harrah's Lake Tahoe the destination of choice. Located at 6,200 feet above sea level, magnificent Lake Tahoe is a paradise for outdoor lovers. Golf at championship courses, ski at world-class resorts, and do everything in between. Harrah's Lake Tahoe offers modern health club facilities for men and women. Our co-ed gym features treadmills, stationary bikes, StairMasters, and Universal free weight equipment. Also available are sauna, steam, whirlpool, and massage facilities.